Alkaline water is one of the best hydrating, most readily absorbed waters on earth. Helping to eliminate negative substances in our body, increase immunity, and can possess self healing properties. Alkaline Cartridges also raise the pH level to make the water more alkaline, creating a healthier environment for the body. The Rain Water Systems Alkaline Cartridge uses a combination of ceramic magnets, magnetite as well as 5 other volcanic minerals and ceramics to produce healthy water, stabilise pH, assist in improving circulation, increase mental alertness and strengthen the immune system. The Rain Water Systems Alkaline Cartridge is especially effective when used with Reverse Osmosis Systems, to replace important minerals, oxygenate and re-energise the water for a healthy immune system. What Should I Expect From Drinking Alkaline Water? Alkaline water is known for its powerful healing and detoxifying effects and can assist the bodies healthy cells become more soluble, which helps the minerals and vitamins vital for maintaining a healthy immune system be absorbed into the tissues. It can also help to suppress the increase of excessive free radicals and protect the bodies cells from various substances that may cause damage. Alkaline water provides the body with oxygen, which gives us energy. It can also have a much smoother taste. How Long Will The Cartridge Last? The Rain Water Systems Alkaline Cartridge requires replacement once every 12 months, depending on the quality of the water and consumption. Some areas may require the Alkaline Cartridge to be replaced more frequently. The Rain Water Systems Alkaline Cartridge is replaced every 12 months and therefore comes with a 12 month warranty on the Housing and fittings only. The Cartridge itself or its ability to maintain its performance is not covered by warranty. Detoxify your body to remove normal acidic waste products accumulated daily, plus remove toxins accumulated in your body from your environment, prescription drugs, unnatural foods and from the ‘normal’ process of aging. Acid wastes collected in the body can lead to more serious health conditions. Drinking alkaline water daily can neutralize and wash acid waste products from cells and tissues. Hydrating your body is basic to maintain or regain optimum health. During ionization your Alkaline Water Cartridge forms your water into micro clusters that are more easily absorbed at the cellular level thus ‘super hydrating’ your body. Alkaline water acts as an antioxidant, scavenging for and neutralizing harmful free radicals. Because alkaline water has the ability to give up electrons, it can effectively neutralise and block free-radical damage to the body. Ionised alkaline water seeks out free radicals and converts them into oxygen which your body can use for energy production and tissue oxygenation. Alkaline water helps to balance the body’s pH, which tends to be acidic because of our high acid food diet, stress and exposure to environmental toxins such as smog. What Is The Cartridge Made Of? Rain Water’s State of the art reverse osmosis drinking water system gives you filtered drinking water at your finger tips! Our system is as good or even better than most bottled water that you buy, and it is conveniently at your kitchen sink. Your water will be fresh, sparkling, odor free, and great tasting. Save money and drink great tasting water. Our system uses the most advanced high efficiency reverse osmosis membrane process available today. Water passes through an efficient pre-filter that removes the larger particles of dirt and debris. Then, the water is squeezed through microscopic pores in the revers osmosis membrane eliminating up to 98% of the impurities. Finally, the carbon post filter removes objectionable tastes and odors to enhance the quality of your drinking water. Water Conservation – Pentair™ Green membrane element & The system shuts itself off when the reservoir is full. Energy Efficient – Requires no outside source of power to function, using only the available water pressure to operate. Economical – provides high quality water for pennies a day, costing considerably less than bottled water. Versatile application – Clearer ice cubes-the system can be hooked up to your refrigerator’s ice maker or dispensing unit. Compact size – The unit is conveniently mounted under the sink and allows room for other household items. 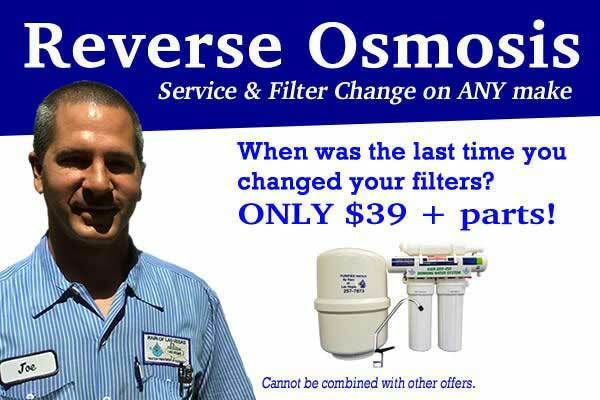 You can stop wasting money on bottled water and start drinking fresh filtered water from your Rain Water reverse osmosis system. Call 702.257.7873 for a free estimate. Rain of Las Vegas Specials! Copyright © 2019 Water Softeners Las Vegas | Water Conditioner | Service. All rights reserved.